Deposit checks electronically from your office at your convenience, meaning fewer trips to the bank, longer banking hours and convenient record-keeping through an automatic image archive. 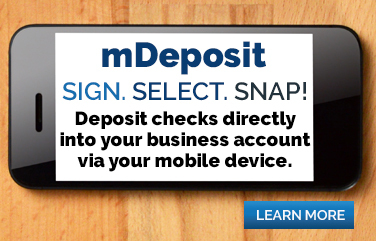 Our remote deposit capture solution helps you save time, reduce expenses, and accelerate cash flow. We install an eDeposit desk-top scanner at your location and provide ongoing client service support. Receive same-business-day credit for deposits transmitted by 5:00 p.m.
Reduce or eliminate trips to the bank. Decrease the check processing period. Eliminate manual deposit preparation and errors. Promptly identify return items and limit risk on bad checks. Download deposit details into accounting software. We provide a desktop scanner for your business location. You scan checks and the captured images are then securely uploaded to a server located at the Bank. We review deposited items for accuracy every hour on the half hour and post credits to your account on the same-business-day by 5:00 p.m.
Our eBanking specialist installs the scanner on a designated computer which has a high-speed internet connection, Windows 7 or newer OS, admin rights and an open USB port. We train your staff who will be responsible for scanning and transmitting the deposits, and we then provide ongoing support.